D-Link’s Gaming Router AC1300 hopes to offer gamers a bit more control over their home network, dynamically giving multiplayer and media devices priority for a lag-free experience. Important Note Before We Get Started: This review for the D-Link Gaming Router AC1300 is a “living review.” At the time of this review, after experiencing a couple of what I felt were significant concerns with the router, I’ve decided that a few days wasn’t enough time to give this device a fair shot. I am publishing my thoughts now, after using the AC1300 for a few days use, and will update the review in about a week’s time with my final thoughts and a definitive score. The Internet is important, and arguably it’s one of the most important necessities when it comes to modern day communication and entertainment. With fast-paced, online-only action titles like the recently-released Titanfall, a lag-free experience is important to being competitive and having a fun time. A stutter in the network speed can be the difference between life and death in online multiplayer games. In a busy, Internet-connected home filled with smart phones, tablets, video game consoles, and computers, how can you guarantee that your high-speed Internet isn’t getting bottle-necked like rush hour traffic on a Friday evening, and more importantly how can you squeeze the most out of your Internet speed when you absolutely need it? 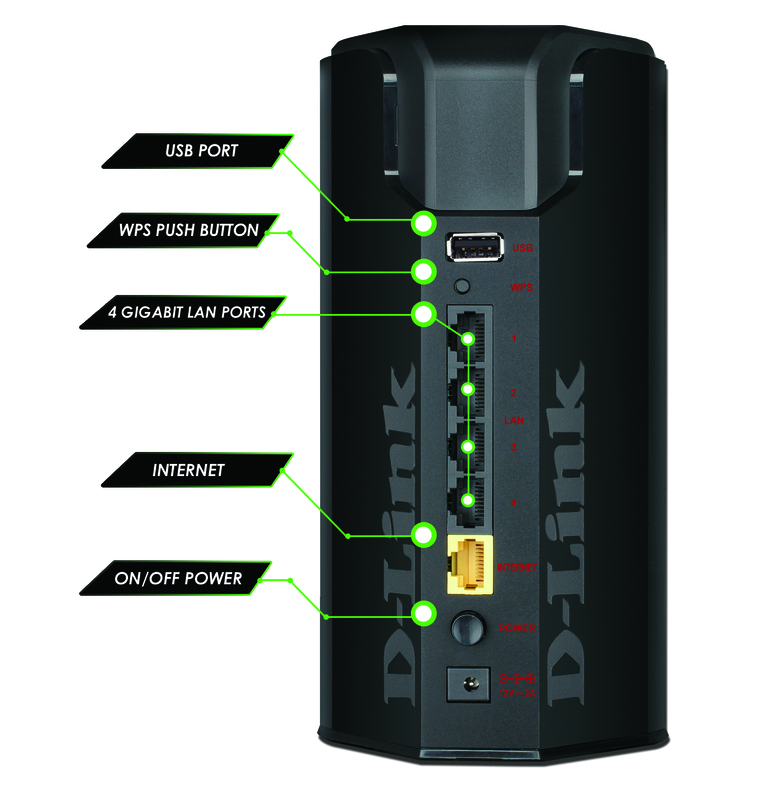 D-Link is hoping to offer gamers more control over the Internet with the D-Link Gaming Router AC1300. They say a chain is only as strong as its weakest link, and this popular saying can certainly apply to your home Internet. Sure, you may pay a lot per month to get the best download and upload speeds, but if you have a lot of devices, simultaneously using the Internet, your empty, seemingly speed-limit free Audobahn may become something of an overcrowded highway. You may start seeing connection stuttering as your devices compete amongst each other for that high-speed connection. The D-Link Gaming Router AC1300 attempts to solve this problem. Let’s take my home for example, we have two desktop PCs, 2 Ethernet-connected video game consoles, 3 smartphones, 3 tablet-like devices, two iPod Touches, an eReader, a business laptop, and a Nintendo 3DS. For the longest time we’ve been using a fairly standard, and severely outdated, Netgear router. To be perfectly honest, it’s served us well and has performed admirably. 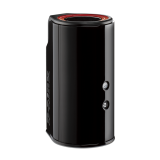 But when I had the opportunity to try something new, with the D-Link Gaming Router AC1300, I jumped at the opportunity to upgrading to something more modern, and get the input from the family. 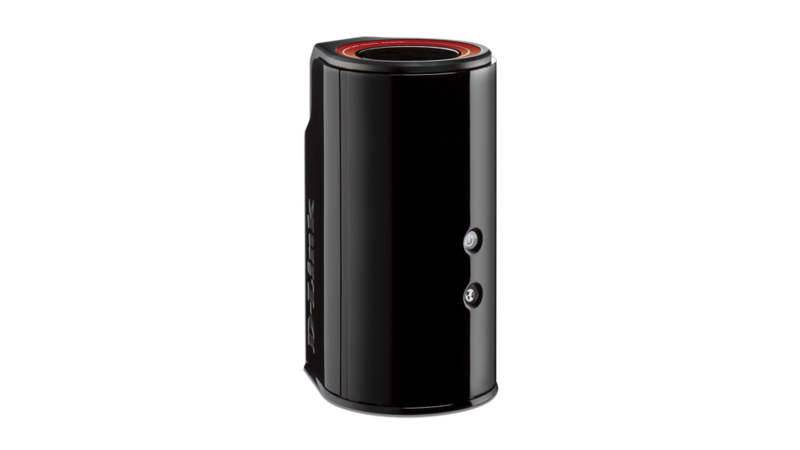 So, what separates the Gaming Router AC1300 from routers? The most significant difference is your ability to give higher Internet speed priority to specific devices. This is done using using Qualcomm StreamBoost. It’s an automatic traffic-shaping network management tool that aims to give optimal performance for games, video, and other latency-sensitive media or applications, and allow you to set a preference as to which device gets the better connection when both are using the same services. The design of the Gaming Router AC1300 is a bit different from most modern wireless routers that I’m familiar with. It sort of looks like the baby brother of the new Apple Mac Pro. It’s black and cylindrical, designed to stand vertically rather than lay flat. The black color seems to fit in well with today’s entertainment centers, especially for gamers: the Xbox 360, PS4, Xbox One, PS4, and even the Wii U all come in black. It blended in well with our entertainment center, especially compared to the contrast of our previous bone-white Netgear router. The AC1300 looks pretty simple from the front, and consists of two lights: one for power and one to show Internet connectivity. On the back there is one Gigabit Ethernet port to connect to your cable modem (or other WAN), and four Gigabit Ethernet LAN Ports for your wired compoents, a WPS (Wi-Fi Protected Setup) push button for easy Internet setup (if your device supports it), a USB 2.0 Port to connect a device to serve as a media server, a power button, and a tiny reset button which can be used to easily reset the device back to factory settings. Setting up the AC1300 was easy. Whether you have some existing network know-how or a novice, you can choose to let the device negotiate with your cable modem to automatically get you up and running, or you can manually tweak and adjust settings. Like all routers, you access the router’s configuration via your web browser by connecting to a local IP address. 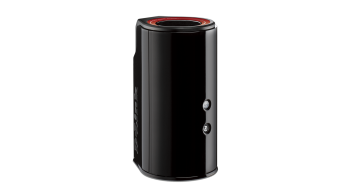 The AC1300 also offers a media server option, to connect a USB thumb drive or external HDD to share video and audio content, rather than needing to host it on another PC or media device. If you turn on network device discovery, the media server will be visible as a network location. I was able to stream video without any problem when I tested it out on two different Windows 8.1 PCs (one connected via Ethernet and the other wireless) and our PlayStation 3 (via wired connection). I wish the USB port had been a USB 3.0 port, allowing faster transfer speeds between your device and the network, but the experience wasn’t that bad using USB 2.0. Also, you cannot add or remove content from the media server, like you might be able to do with a shared media drive, so updating content on the media server device will need to be done manually. 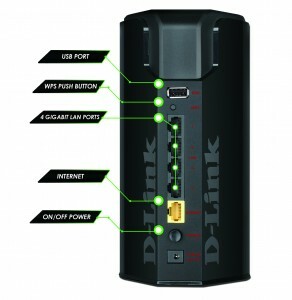 So, after using the D-Link Gaming Router AC1300 for several days, how has the experience been? Well, to be honest, there have been a few pluses and a quite few minuses. Let’s start with the bad new first. Altogether, there were two major issues with the AC1300 – one from me and the other from my 15-year-old. My gripe was that when setting up the router and reconfiguring it, there seemed to be a lot of changes that required the router to restart. Some of these, like resetting the admin password, makes sense, but creating and establishing time schedules didn’t. With as many devices as we have connected to the Internet, you can imagine the number of loud groans I heard from across the home when a setting change required a reset. Like a business enterprise network administrator, there never seems to be a good time to take the Internet offline. My 15-year-old’s problem, and honestly probably the biggest issue with the router, was that he noticed a significant slowdown while playing online multiplayer two Ethernet-connected devices: our high-end desktop PC and the Xbox 360. During these times he experienced stuttering and lag, and was even disconnected from Xbox Live when the Internet speeds were so bad. While I didn’t witness this myself, as this occurred sometime around midnight, I woke up to a few frustrated text messages on my phone of issues that he had during his late-night gaming with his friends. I requested that he let me know how the experience was, as his thoughts would weigh heavily on the review of this router. I verified the StreamBoost settings to confirm that the PC and the Xbox were set at the highest priority, but there were still complaints when we tested it out into the early evening. To see if the StreamBoost’s priority was possibly the issue, I disabled it… and that seemed to correct the problem. While the StreamBoost seemed like a nice feature to give a bit of granular control to the home network, one of the things I didn’t like was the strange UI in setting device priority. I wish there was a better way to set priority in a similar way of reserving an IP address for a device based on its MAC address. My wife also complained about slow, general Internet use, prior to the StreamBoost disabling while she was using the same high-end PC that my 15-year-old used for games. On a handful of occasions, I also experienced slowdown and some semi-unresponsiveness when using a web browser on my Surface Pro 2, and when running a speed test via http://SpeedTest.net it resulted in some pretty low numbers — as low as 2 Mbps download when I normally see averages around 15 Mbps up to 25 Mbps. A few minutes later, the network speed would seem to stabilize and return to its normal averages. So for all of the benefits that this router offered, in the end, disabling StreamBoost seemed to help improve the network speeds and calmed the angry mob. Now, onto the good aspects of the D-Link Gaming Router AC1300. The aspect I liked the best about the AC1300 was the amount of customizing I could do with the settings. Not only could I assign and reserve local IP addresses to each and every device on the network, I was able to set up schedules (and multiple schedules) to allow or limit Internet usage for one or multiple devices. This has given me a greater level of control over our Internet than I have ever had before. Port forwarding was also a lot more detailed than I’ve been used to, and opening the required ports for our local Minecraft server was easy. If there ever comes a need to block or limit Internet activity — to help discourage those up-to-5am gaming nights for just the Xbox 360 and PlayStation 3 — I am able to do that without having to apply the same limitations to all devices on the network (or coming up with a creative workaround). Overall, as a router, I like what the D-Link Gaming Router AC1300 has to offer, however, at the time of this review, I’ve had to disable the StreamBoost feature in order to appease both the gripes from my wife about slow general Internet usage as well as those from my teenage son who complained about significant slowdown on both PC and console gaming, as well as a Xbox Live disconnection while using this device. With StreamBoost being a pretty significant feature of the router, I think disabling it was a pretty significant concern. That being said, I feel that I cannot award a score to this device, until we give the router at least another week of solid home use, in order to really give it a fair review. So, for the time being I will leave this review unscored. In the meantime, I will reactivate the StreamBoost, research similar issues with other Game Router AC1300 owners, and see if I can get the network speeds to improve over the next 7 days, at which time I will award a final judgment.